At the end of 2016, myself and a couple friends, began to plan a cross country trip, to ride mustangs from Mexico to Canada, so that we could share our story of hope and healing. 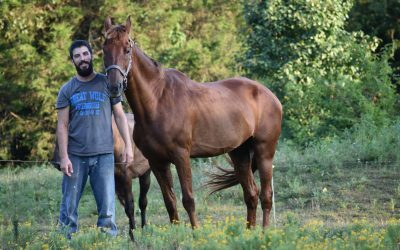 The ride, planned for 2018, would be an opportunity to help people experience the healing that comes with working with horses. From the beginning, I knew I wanted to adopt a wild horse to take with us. 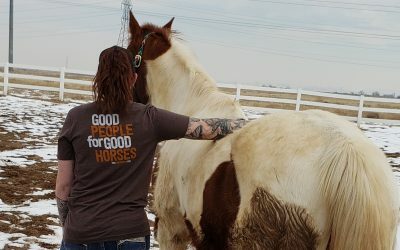 In November of 2016, my friend and TIP trainer, Katie, another rider, Olivia, and myself headed off to an adoption event where there were only 10 geldings to choose from. This event was my first time trying to pick out a horse. Did I really know what good confirmation looked like? How do you tell what a mustang’s personality will be like when it’s wild in a pen? What if I picked out a crazy one? I was so nervous, but with encouragement from Katie, we settled on a two-year-old gelding from Nevada. From the moment Luke loaded onto the trailer, I knew I was in for a learning experience. The ride, Mustangs on a Mission, was to help people find healing and confidence, but adopting Luke was my opportunity for healing and growing in my confidence. Starting out, I was so terrified. I did not believe in myself or my ability. I couldn’t trust Luke. I was so nervous my brain basically shut off when I tried to do anything with him. Every time I was unsure of myself, it would reflect in Luke’s actions. He would spook at something or he would refuse to move forward. The first time I rode him I got off balance at his trot and he just got faster and faster and for a moment I was sure it would end badly until he just stopped. This horse, mustang 2376, Luke, filled in the holes for me even as a two-year-old, wild horse. The heart and try in him is incredible! He has taught me more about training horses and myself then I have taught him. To date, Luke has taught multiple people how to ride, has carried me over 150 miles across Arizona mountains and desert, become the face of Mustangs on a Mission, and has totally changed my perspective on myself and training horses. This horse has saved me from myself in so many situations. He has humbled me, taught me, and given me his heart and trust. Together, we can accomplish more than I could have ever imagined. Of all the mustangs I could have ended up with, Luke was the right horse. #RightHorse means so many things to me. The right horse is so different for each person depending on their goals and what they want to do. 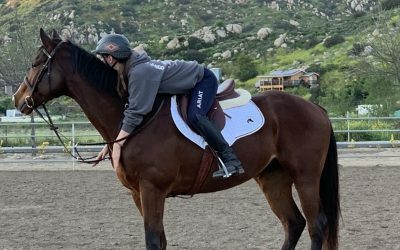 Personally, the right horse is one with a sweet personality that I can take on trails and climb mountains with then turn around and work on reining maneuvers in the arena with. It’s a horse I can let friends and family ride to learn about horses. One that is gentle enough for kids to climb all over yet with enough try to get a job done. Each person needs to find their #righthorse and I was so blessed the day I chose Luke from the BLM holding pens. The right horse is more than the horse’s training or skills, it’s about the horse’s heart and try, it’s ability to meet its rider where he or she is. The #righthorse is one who meets the needs of its owners. At this point I had seen lots of great horses but none of them made me think “I cannot live without this horse”; that is until I met Bindi. Bindi was beautiful! She was more than anything I could have ever dreamed up in my head.